This fall we have introduced some new items to our butterfly jewelry line which we are really excited about. 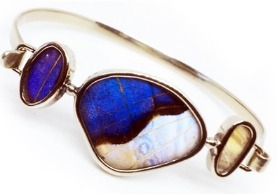 The "Tres Mariposas" or "Three Butterflies Cuff" uses a tempered silver band to hold three different parts of the butterfly wings. Featured here with Morpho Sulkowskyi and the Blue Morpho. The "Flutter Earrings" are one of our larger earrings with a unique hand made shape. 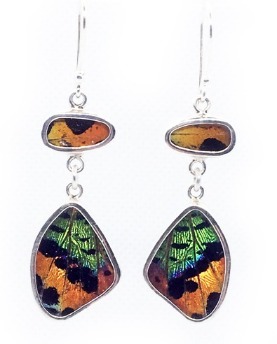 Can be matched with our wing shaped pendants for a matching set: Featured displaying Chrysiridia Rhipheus. The "Halo Earrings" have a little more funk! 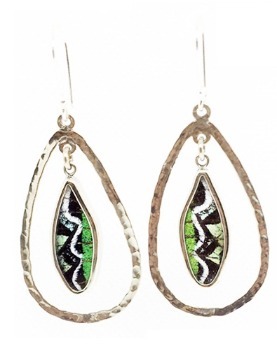 With a hand hammered silver hoop surrounding a beautiful butterfly wing hanging in its center. The "Cascade Pendant" was inspired by the cascading waterfalls of the Amazon. Made from three cascading circles, each with their own butterfly, and connected together with silver. Silver Tree Designs is a wholesale company offering boutique jewelry to retailers nationwide. We are dedicated to fair trade criteria when sourcing our products. Please see our What is fair trade" page for more details regarding the criteria for fair trade. Silver Tree Designs pays over 50% of costs before production begins to ensure that no financial burden is put upon our producers and we are dedicated to building long term sustainable relationships with our producer. About 60% of the listed wholesale price remains with our producer in Peru. 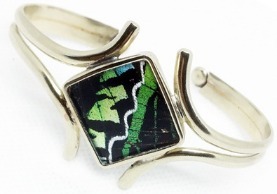 Our boutique jewelry line is of the highest quality, it is all hand made and is made from real butterfly wings. We offer wings that have been framed in either sterling silver or silver plate. 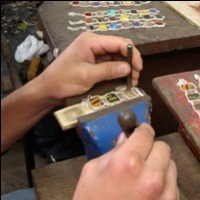 To learn more about our artisans, please go to our "Artists" page. 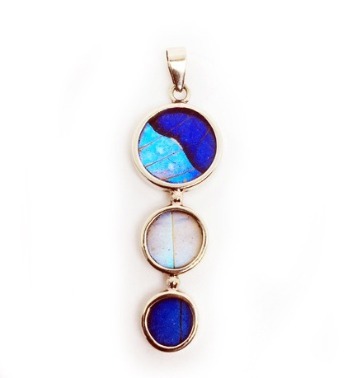 If you are not a retailer seeking to carry our jewelry in your store and wish to purchase individual pieces of our butterfly wing jewelry, please see our list of customers that may be selling in your area, or online.